Aymenn Jawad Al-Tamimi is a research fellow at the Middle East Forum. This article was sponsored by Campus Watch, a project of the Middle East Forum. Yet MESA has launched self-righteous fulminations against the Times and Callimachi. Initially, it sent a letter to the paper criticizing it for referring to the documents in its articles, declaring that creating a public database of them is “unacceptable,” and insisting the documents be returned immediately to “the appropriate Iraqi authorities.” After the Times and GWU’s Program on Extremism announced their partnership, MESA sent a letter to GWU dubbing the project “problematic” and repeating its opposition to an open access database. MESA’s narrative is simplistic and short-sighted and unjustly implies that the Times engaged in criminal activity. There have been no “legally designated representatives” of state entities in the field to authorize or reject the collection of ISIS documents by journalists. In Northern Iraq, the de facto authority was the Iraqi security forces with whom the Times’s reporter was embedded. On occasion those forces granted permission to take papers simply because they did not deem them vital for intelligence efforts. 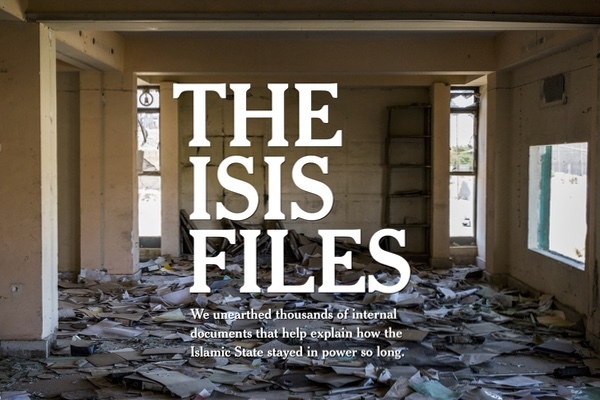 Documents listing names of ISIS personnel, for instance, are of far more interest to security forces than those outlining the structure of a dismantled ISIS bureaucracy in a liberated area. Furthermore, some documents would have been destroyed had there been no third-party interest in collecting them. In other instances, documents were recovered from locales and buildings that had otherwise been overlooked. Were it not for the New York Times’s efforts, those documents would likely have been lost forever. In my case, I collected as many ISIS documents as possible from the group’s former zone of control in the North Aleppo countryside in Northern Syria. That area is now controlled by local Syrian rebels under a Turkish occupation force. Should I give my collection to the Syrian government in Damascus, or perhaps the Turkish government in Ankara? It is unclear how MESA thinks a repository accessible to all Iraqis will be created if there is no publicly accessible online database. Owing to the outcry from MESA and others, the paper is giving the original documents to the Iraqi government, at the latter’s request. Yet we are not dealing with a government known for bureaucratic efficiency. Beset with problems such as reconstruction in liberated areas and protests in the south against poor public services, the Iraqi government is very unlikely to create a repository of ISIS documents accessible to all Iraqis. MESA should drop its affectation of moral superiority and carefully examine the documents for itself so as to pose legitimate research questions. Did the Times, for instance, select certain documents to support favored conclusions? Was the paper taking the documents too much at face value? These and other important questions can be addressed only by a transparent and open debate. But MESA would rather restrict access to a privileged elite of researchers, as was the case with the Ba’ath Party documents taken from Iraq after 2003. It is unlikely MESA would have protested had a regional Middle Eastern news outlet taken the ISIS documents from Iraq and reported on them. (Their failure to protest my own work also illustrates this selective outrage.) MESA’s real objection is that a Western outlet tracked down the documents and published the reports—an intellectually vacuous form of identity politics reflecting MESA’s biases that have gained far too much currency in academia. However MESA spins it, the Times and Callimachi have greatly contributed to our ability to research the history of ISIS. The planned public archive of documents will only strengthen that contribution.